I decided to reach way back through the years for this edition of Retro Friday. I have several aunts who are readers. And they have always looked after me when it comes to sending books they think I'd like my way. Particularly during my formative reading years. To this day, many of the books nearest and dearest to my heart came to me in the mail from one of my aunts. When I was twelve or so, my Aunt Becky sent me a lesser known book (which I had never heard of) by a very well known author (which I had). 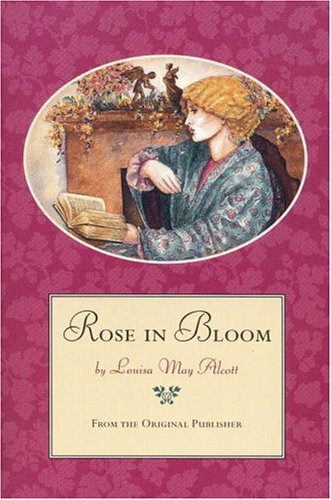 The book was Rose in Bloom and it was actually the first book I ever read by Louisa May Alcott. It is also actually a sequel to her earlier book Eight Cousins . I didn't know this at the time, though, and so I cracked it open completely unaware of what to expect in the way of the writing, the style, or the characters. 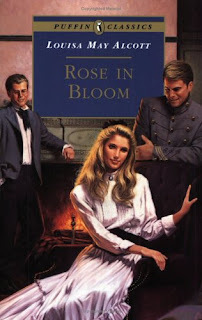 I've since gone back and read Eight Cousins , but, perhaps simply because I read it first, or perhaps because it feels like a slightly more mature and focused character-driven story, Rose in Bloom has always been my favorite. I've read it many times, though I realized it's been quite a few years since I picked it up last. But Rose's coming of age story, her love for her family, and the important dilemmas she faces never fail to make me feel nostalgic and want to return to spend more time with her. Rose Campbell has been traveling abroad with her Uncle Alec and her maid, friend, and companion Phebe for the last several years. Now she has come of age, come into her inheritance, and come home to Aunt Hill--the family stronghold--to reacquaint herself with her seven male cousins as well as her family's expectations that she settle down and marry one of them at once. But Rose has grown up quite a bit in the intervening years and is not at all sure she's ready for matrimony. Surprising the whole clan by insisting upon establishing herself as an independent woman before choosing a husband, she holds their uneasiness and disapproval at bay and takes her own time evaluating her options and settling on a course of action. Meanwhile, the various aunts are in various states of uproar and decline. Her former maid and now friend Phebe is caught uncomfortably between two worlds as she is forced to determine what she will do with her life now that Rose has no official need of her and she has little money of her own. And then there are the boys. The seven boys who've unexpectedly grown into men and who are each so very different and each have their own unique relationship with their cousin Rose. Their wildly different personalities, habits, and desires at times clash with their parents' wishes and their choices, along with Rose's, dramatically affect every member of the Campbell family over the course of the novel. Three young men stood together on a wharf one bright October day awaiting the arrival of an ocean steamer with an impatience which found a vent in lively skirmishes with a small lad, who pervaded the premises like a will-o'-the-wisp and afforded much amusement to the other groups assembled there. "They are the Campbells, waiting for their cousin, who has been abroad several years with her uncle, the doctor," whispered one lady to another as the handsomest of the young men touched his hat to her as he passed, lugging the boy, whom he had just rescued from a little expedition down among the piles. "Which is that?" asked the stranger. "Prince Charlie, as he's called--a fine fellow, the most promising of the seven, but a little fast, people say," answered the first speaker with a shake of the head. "Are the others his brothers?" 'No, cousins. The elder is Archie, a most exemplary young man. He has just gone into business with the merchant uncle and bids fair to be an honor to his family. The other, with the eyeglasses and no gloves, is Mac, the odd one, just out of college." "Oh, he is Jamie, the youngest brother of Archibald, and the pet of the whole family. Mercy on us--he'll be in if they don't hold on to him!" I do love those boys. Upstanding Archie, quiet Mac, princely Charlie, the beanpole brothers Will and Geordie, dandy Steve, and impish Jamie. When I first read it, this book reminded me quite a bit of Anne of Green Gables and, though overall a less complicated and somewhat rosier tale, it is not without its heart-wrenching moments and instances of tragedy. 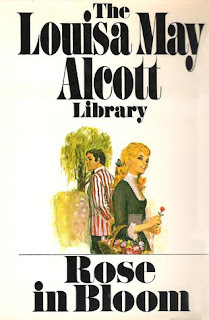 I appreciated the way Alcott addressed the many vices and challenges young men and women in their early twenties face and it never fails to surprise me how those hurdles have not changed so very much since this book was first published in 1876. It's interesting to me that it is so often billed as a children's book, as the themes it explores seem much older to me. Particularly as Rose does, in the end, come to an informed (if painful and complicated) decision as to where her heart lies. But then I read it first when I was twelve, and again every couple of years after that, and gained something new every time I did. How sad it must be to never re-read good books and never experience that unforgettable moment of realization that both you and the book have brought more to the table than was there the last time you met. Recommended, unsurprisingly, for fans of Alcott, Montgomery, and Eva Ibbotson. I absolutely loved Eight Cousins and Rose In Bloom. I would recommend another Louisa May Alcott book if you liked these. It's called An Old Fashioned Girl. If you liked Rose in Bloom then you'll like An Old Fashioned Girl also. Thanks for reminding me about this book. I haven't read it for many years but I loved both it and Eight Cousins. One of my favorite childhood reads! I adored Rose in Bloom and Eight Cousins. I'll have to bit the nostalgia bullet and read some of my faves from childhood. Oh, I remember loving this too. Thanks for the trip down memory lane - it may be time for a re-read of both Eight Cousins & Rose in Bloom. I'm struggling to remember the cover I have though, definitely not any of the three you picture. I like the one on the left, it's sort of retro. Don't be shocked but I've never heard of this book! But one with a cast of well-written brothers? I'm sold. And btw, that middle cover? Just awesome. Jessie, wow, I was figuring I'd be lucky if I got two comments from people who'd read this book. I'm thrilled you've read both! And I have heard of AN OLD-FASHIONED GIRL and wondered about it. Now I'm definitely going to pick it up. Thanks for the rec! Liz, this is honestly a treat hearing from others who've read and loved it. It's been several years for me as well but Rose had just been on my mind lately. mainhoonemily, now I have to know which other Rose character you were in love with! :) And I will, of course, be anxiously awaiting your thoughts on PERFECT CHEMISTRY. Enjoy! Melissa, awesome! I should have known you'd have read these two. Man, I fell for Charlie hard back then. I still feel sad over that whole situation...but very happy with the way things wrap up for Rose. Li, I couldn't find an image of the cover of mine either. It's a red Dell Yearling edition with Rose walking arm in arm with Charlie on one side and Mac on the other. I <3 it. Though the one on the left is awesome and I wish I owned it as well! Michelle, lol. No shocking me with that one. I'm shocked there have been so many here who've read it! Shocked and delighted. I think you'd love this one, though. And that middle cover still gives me the shudders. Ugh. Thank you so much for reminding me of one of my favorite books from my childhood. And now, I'll have to re-read it. I love Rose in Bloom! I think my first Louisa May Alcott book was Under the Lilacs and I still have a soft spot for it. I've never heard of this one! But then again, I live in the boondocks so it should come as no surprise. I will take note of this. :) Thanks for the review. Count me as one of those deprived souls who didn't even know about the existence of this novel. Having loved Eight Cousins--as well as Little Women and all the rest of them--it's now my mission to find a copy of Rose in Bloom for my very own. Thank you, Angie, you book pusher you! 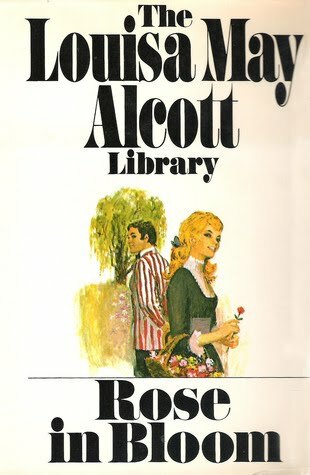 I reread Rose in Bloom recently, for the first time as a grown-up, and I am much more impressed with it now than I was as a kid. But I always liked Louisa May Alcott's non-Little-Women books. My favorite is probably Jack and Jill, which really NOBODY has read, but I love it. I have yet to read anything by Alcott(but I do own two copies of Little Women; one Norwegian and one English, plus a copy of the follow up book to LW). I love the sound of Rose in Bloom and Eight cousins! Ellyl, oh man. It is seriously so fun to hear from others who loved it that much, too. Misti, I've never read UNDER THE LILACS! If it's still your favorite I should probably go check it out. Azteclady, oooh. You've read EIGHT COUSINS but not ROSE IN BLOOM!? Then you definitely need to read it. And I can't wait to hear what you think. I love discovering sequels I had no idea even existed waaaay after they were written. That happened to me with SUMMER OF MY GERMAN SOLDIER and MORNING IS A LONG TIME COMING. Man, was I happy to find that book. Charlotte, *grin* excellent. Seconded and noted. I loved Eight Cousins but I don't remember Rose in Bloom as much. I think mostly because they killed off the character that I loved in the first novel and I never got over it. I was very lukewarm about Mac. This is the kind of book you wish would go on forever. It defines the word classic in every way. Everytime I read it, I fall in love with Rose, Mac, Uncle Alec and the others over and over again. It is one of my most favourite books (and seriously, in my opinion and in the opinion of many others I'm sure, it is BETTER than Little Women!!) It doesn't matter if you're young or old..... NEVER PASS THIS BOOK UP!! You will laugh, you will cry, and like me, you will wish it would never end.